Couscous, which is often mistaken for a grain, is actually a type of pasta made from semolina and wheat flour. Like most pastas, couscous by itself doesn’t have a lot of inherent flavor, but it’s fantastic at absorbing and enhancing the flavors of whatever it is prepared with (and you can literally prepare it in minutes without heating up the kitchen!). 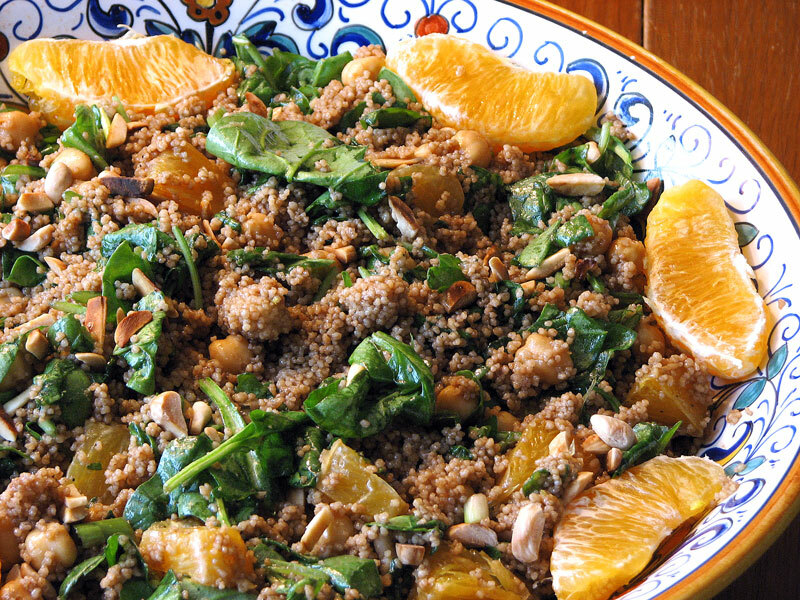 In this recipe, the couscous is made with low-fat, low-sodium chicken broth (or vegetable broth) instead of water and is then tossed in a dijon-orange vinaigrette with spinach, green onions, almonds, orange slices and garbanzo beans to make a great, light and refreshing summery main course salad.